Let’s face it! Very few of the online stores are out there which are running the default plug and play setup of any ecommerce platform. There are always some mandatory tweaks that everyone makes to personalize the store according to their needs. And Magento 2 is no exception. A lot of the times you are prompt with errors during Magento 2 installation, and you just go berserk when it happens. But don’t worry. In this blog, I am going to address and solve the basic errors that occur during Magento 2 installation from the get-go till the phase where you add different products. This the most common error which occurs at the first step of Magento 2 Installation. The error state always_populate_raw_post_data = 0. It is possible that there are some configuration issues in you php.ini file. Don’t worry, it’s easy to fix. Locate php.inif file in your wamp or XAMP respectively. You can search this file in the root folder or sub folder with name PHP. Easy way is to let your operating System search it for you. Once you locate the file, open it in your favorite editor (I use notepad++) . Find always_populate_raw_post_data and remove the semicolon from the start of the line and change the value ON to -1 Initially, it will be: ;always_populate_raw_post_data = On Change it to: always_populate_raw_post_data = -1 Now save the file and close it. Get back to your Magento installation wizard, you can see the error is resolved now. 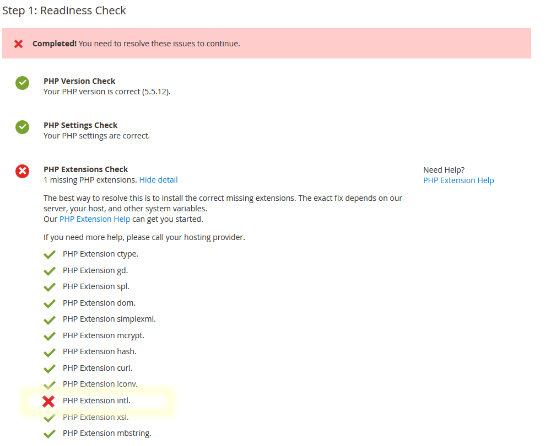 PHP extension error in Magento 2 installation. PHP extension intl is another common error that occurs in Magento 2 installation wizard. In most cases, PhP extensions are commented or turned off. Stay calm. Go the php.ini file and find line php_intl.dll. You can see ;extension = php_intl.dll change it to extension = php_intl.dll Removing the semicolon will uncomment this line and activate php_intl.dll extension. Now save the file and go back to the installation wizard. This problem should be solved now.